What is Mac Recovery Mode? Restore from Time Machine Backup: Use a previous version of your Mac stored on an external drive. You will have had to prepare this is in advance by connecting an external hard drive and using Time Machine to copy all of your data, including files, OS, and settings. If you have an external copy, you can use this to restore your data under the ‘Restore from Time Machine Backup’ in Recovery Mode, which will erase the current disk. Reinstall macOS: This wipes your current OS and its data and replaces it with a clean version. If you have any files you need saving, make sure that they’ve been uploaded to the iCloud or some other storage, whether online or on a separate hard drive. Which version of macOS that is reinstalled may depend on whether you run the normal Recovery Mode or Internet Recovery Mode. Get Help Online: Recovery Mode allows you to use Safari to troubleshoot issues you may be experiencing. Disk Utility: If you suspect there’s something wrong with your drives, you can scan, verify, and repair them from the recovery screen, which might be a quicker and more convenient alternative than erasing and reinstalling your macOS. Now, if you are considering a complete restart in Recovery or Internet Mode, it’s recommended that you give your Mac a thorough clean first. Otherwise, this is like cleaning the house, then dumping everything you’ve hoovered back onto the carpet. The muck has only been moved around. With a tool like CleanMyMac X, you can declutter everything you don’t need, then back up safely (always best doing before restarting or rebooting), which means it should run much faster once restored to full working condition. By the way, this app removes up to 74 GB of junk on an average Mac computer. So, give it a try — you can download CleanMyMac X for free. Normal Recovery Mode accesses Recovery HD, an emergency cache of essential utilities that is saved to a partition in your Mac's startup drive, meaning that it’s kept separate from the rest of your disk space. Because it’s been partitioned from the rest of your disk space, the data can’t be cleared in cleanup scans or manually deleted. It’s small (650MB) so it won’t affect your Macs performance, but it may be useful if something goes wrong. If you do need to reinstall your macOS, Recovery Mode will reboot with the most recent version that has been installed on the computer. Internet Recovery, however, can only reinstall the version of macOS that was originally on your computer when it was new from the box, which likely won’t be the most up-to-date version. This is because Internet Recovery uses code embedded into your Mac that includes an image for the appropriate OS. When you begin Internet Recovery, the image is transmitted to the Apple servers to request the correct codes for reinstallation. 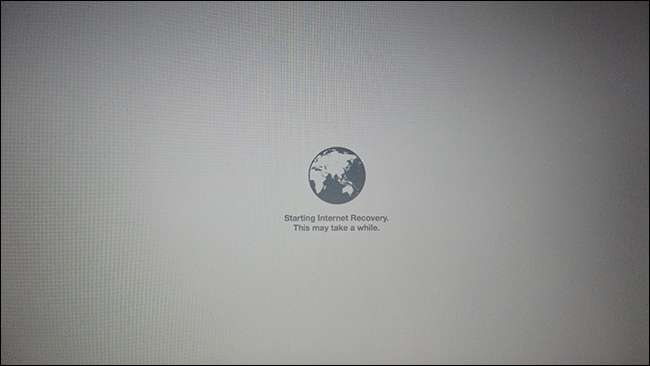 Booting from Internet Recovery takes much longer than a normal partition-based recovery and, naturally, requires an internet connection, so ensure your connection is stable and that you have adequate power (keep your Mac charged). If your Mac has been unable to create a partition for the Recovery HD, you will not be able to use normal Recovery Mode. This might be because you’re using a RAID volume, which doesn’t support the recovery partition, or your drive has been partitioned with Boot Camp Assistant and subsequently modified. Your Mac may have successfully created the Recovery HD partition but Recovery Mode may not be able to access it. This might be due to damage to the drive or a more serious error in your system. If your computer is unable to access normal Recovery Mode, it will automatically begin Internet Recovery. If you have a working recovery partition, you will not be able to access internet Recovery Mode. Hopefully, you’ll never have to use either the normal or internet Recovery Mode for your Mac, but if you do it’s simple to access. For both recovery modes, you will need enough power to see you through the process as well as your Apple ID to reinstall macOS. 1. To start your Mac in Recovery Mode, first, if your Mac is turned off, switch it on. If you’re currently using it, hit Restart. You can only use Recovery Mode from the startup drive. 2. As soon as you hear the startup chime, hold Command (?) + R.
You will need to hold the keys until a new screen appears. 3. If you have a working recovery partition, you will enter the normal Recovery Mode. 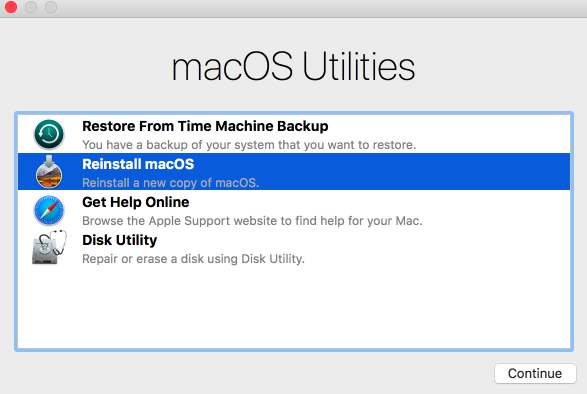 The macOS Utilities window appears, which will list the four options to recover your Mac (Restore, Reinstall, Get Help, and Disk Utility). Select Reinstall macOS. From there, your Mac will be cleared and rebooted with the latest version of macOS that had been installed on it. 1. Turn on your Mac or restart it as with normal Recovery Mode. As soon as you hear the startup chime, press and hold Command (?) + Option (?) + R.
If your normal Recovery Mode isn’t available, pressing Command (?) + R should automatically redirect you to Internet Recovery mode. 2. After a few seconds, a globe will appear onscreen with the text: Starting Internet Recovery. This may take a while. Note: This is your computer entering internet Recovery Mode; it is not yet reinstalling OS X. 3. You will then be given a network list to choose your internet connection for the download. Press the check mark to continue or hit Enter once you have selected your network. 4. You will be asked to resubmit the network password even if you have previously connected to it, so make sure you have it available. Hit Enter or the check mark symbol to continue. 5. The screen will then show the image of a globe again, as well as a status bar. This is your computer sending the information about its original state to Apple to request the appropriate drivers and may take some time depending on your internet connection. 6. Once complete, you will see the same Utilities screen as the regular Recovery Mode, which gives you the same options to restore your system. It is always worthwhile to run a Disk Utility scan if possible before reinstalling your macOS. It’s even better to keep your Mac maintained with regular scans for issues that can accumulate to cause problems. 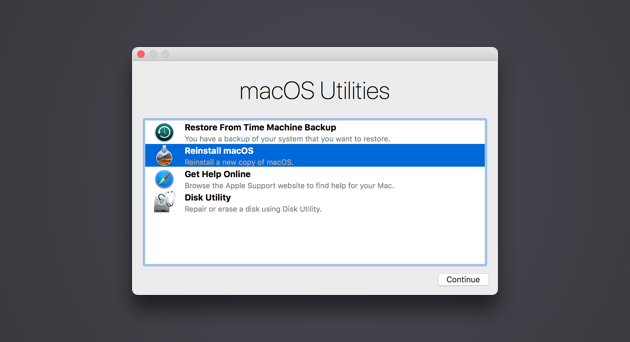 Give your Mac a complete tidy up before restarting in Recovery Mode. Clean out the junk, declutter and restore your beloved Mac to full health. Caches and system junk quickly build up to clog your system and cause performance problems that might lead you to believe you need to reinstall your macOS, when really all it needs is a thorough clean-out. CleanMyMac X has cleared 737 million GB of junk files that wear down your system and uninstalled 10.5 million unnecessary applications and their forgotten extensions. CleanMyMac X can also run diagnostics without entering either Mac Recovery Mode, meaning you can fix operating issues before you need to initiate a full reinstall. 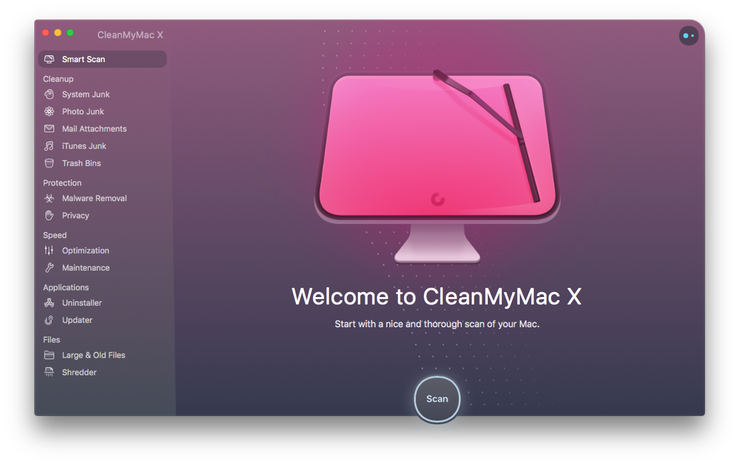 Get CleanMyMac X to improve the longterm performance of your Mac!